Minnesota GreenCorps is an environmentally focused AmeriCorps program coordinated by the Minnesota Pollution Control Agency (MPCA) that places members in organizations around the state to help address critical environmental issues. This year, five GreenCorps members are working on improving stormwater in Minnesota. Steven Yang (far left) is working at the Capitol Region Watershed District in St. Paul on their stewardship grant project. He's coordinating inspections, calculating volume and pollution reductions using the minimal impact design standards calculator, producing GIS maps, and collaborating with community partners. At the Washington Conservation District in Oakdale, Drew Chirpich (second from left) is inventorying existing stormwater practices, assisting local units of government to prioritize repairs, and guiding seasonal maintenance crews. Drew is also working with the Master Water Stewards program and delivering education and outreach to agencies and community members. At the Carver County Water Management Organization in Chaska, Jackie Seamans (third from left) is creating a stormwater pond plan for homeowners associations, developing new partnerships and materials for citizens, and assisting with aquatic invasive species work. Lauren Jensen (fourth from left) is working for Winona County designing outreach materials on sound stormwater practices for residents. She is also helping the City of Winona implement the water quality improvement plan for Lake Winona, and developing a comprehensive report on the Whitewater Watershed Project. 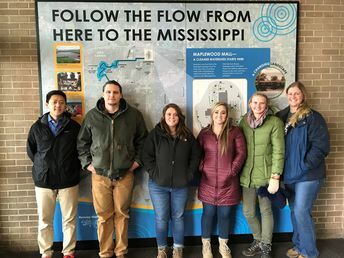 Emily Johnson (far right) is working at the Anoka Conservation District in Ham Lake where she is creating outreach and education materials and developing a grading criteria for stormwater practices. The aim is to improve the operation of poorly performing practices. If a Minnesota GreenCorps member would be helpful in your organization, go to the Minnesota GreenCorps web pages and sign up to be notified about future opportunities. Atwater Cosmos Grove City (ACGC) School in Atwater: The Middle Fork Crow River Watershed District and the ACGC School used money from the City of Atwater and a Clean Water Fund Community Partners grant to incorporate porous pavers and a stormwater planter/tree trench in the school's courtyard. The school's ACGC Youth Energy Summit helped design and promote the project. Read the full story here. Upper Villa Park in Roseville: The softball field is now irrigated with rainwater collected in an underground cistern. The $1.2 million project was designed to keep Lake McCarrons from turning green and to conserve drinking water. The systems will capture and filter 18.7 millions gallons of runoff, preventing 50 pounds of phosphorous from entering the lake annually. 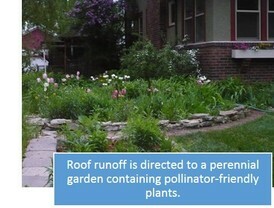 Reusing rainwater for irrigation will save up to 1.1 million gallons of drinking water each year. Read the full story here. Comfort Lake-Forest Lake Watershed District ($135,000) — Alum treatment in Moody Lake. Becker Soil and Water Conservation District ($376,250) — Several projects targeted at phosphorus reduction, including shoreland stabilization, native shoreland buffers, diversions, and raingardens. If you are looking for sources of funding for your stormwater project, go to the Funding page in the Minnesota Stormwater Manual. Most respondents would prefer to get their technical assistance through fact sheets/guidance documents or webinars.More than 80% indicated that they would be interested in model ordinance language for construction site stormwater runoff control and/or post-construction stormwater management. More than 70% would be interested in connecting with partners to fulfill the public education and outreach requirements of the MS4 General Permit. The electronic survey was open from early October to early November and was promoted in the fall issue of MN Stormwater News, via email, in the Minnesota Stormwater Manual, and via partners such as the Minnesota Cities Stormwater Coalition. For more, see the Survey Results page in the Minnesota Stormwater Manual. The municipal stormwater program recently launched an MS4 digital document library where the MPCA can store and circulate examples of documents used to manage SWPPPs. You'll find inspection checklists and forms, site plan review checklists, documentation tracking mechanisms, standard operating procedures, and more to help you implement your SWPPP. MPCA staff have reviewed the materials to ensure they all comply with the MS4 General Permit. Check it out today! In the Twin Cities metro area, an estimated 365,000 tons of salt is applied to roads and sidewalks. Salt and other de-icing chemicals can travel with snowmelt and rain to surface waters where it only takes a teaspoon of salt to permanently pollute five gallons of water. This harms aquatic life and habitats and reduces water quality. 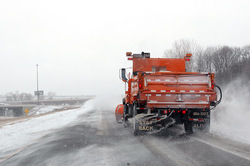 Communities can reduce their salt use with best practices such as slowing salt application from salt trucks, calibrating their salt application technology annually, and training staff on salt application. Proper salt application can protect the environment and save your organization money. 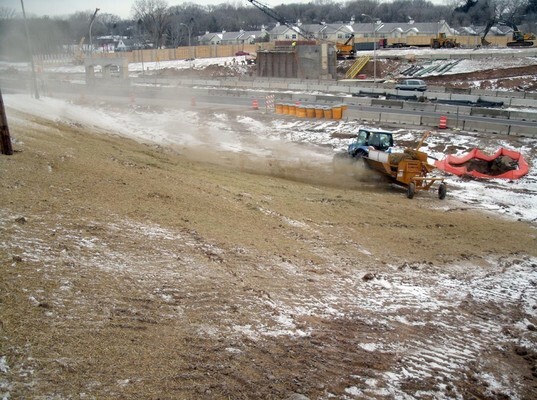 If you’re interested in learning more or becoming certified in snow and ice control, see the MPCA’s salt application training web page. Check if water near you is impaired for chloride with the Chloride Project Map. See the Winter Maintenance Assessment tool web page for additional ways to reduce salt use. Use straw mulch as a temporary erosion control instead of hydro mulch on snow-covered soils. Mulch on bare frozen soils will require spraying a tackifier or water over it to freeze it in place. If installing erosion blankets on frozen soil, use nails with washers instead of staples. If the ground is too frozen for silt fence, try rock-filled logs that will conform to the ground without stakes. If there is enough snow around, you can pack snow berms as perimeter control until a more suitable measure can be installed. 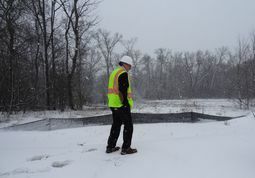 Weekly inspections are still required in the winter if construction is active. If work is suspended due to frozen conditions, weekly inspections are no longer required. However, the site must be inspected within 24 hours of any runoff event from snowmelt or rain that occurs prior to resuming construction. At that time, ensure maintenance is performed on failing BMPs. Keep records of all your inspection and maintenance activities. Be sure to enter your permit ID number and data for all months your facility was active in 2017; for most permittees, that’s the whole year. Find detailed instructions on completing your annual report here.Submit electronic forms via email, or you can mail it in. Questions? Visit the Industrial Stormwater Program web page, email stormwater program staff, or call 651-757-2119 or 800-657-3804 (non-metro only). The Minnesota general Municipal Separate Storm Sewer System (MS4) permit requires training of all field staff in illicit discharge recognition and elimination (IDDE). This spring, the University of Minnesota Erosion and Stormwater Management Certification Program is offering a 2-hour IDDE workshop. The workshop meets the MS4 permit training requirement and covers the definition of illicit discharges, how to identify pollutants, how to track the pollutant sources, and response procedures. Attendees of this workshop are typically municipal staff who inspect storm sewer pipes, respond to complaints,or are routinely in the field. For more information and to register, visit the U of M web site. Register today; workshops often fill up two to three weeks before the class. Visit the U of M Erosion and Stormwater Management Certification Program’s web site to register. Joe Bischoff, Principal Aquatic Ecologist, Wenck Associates, Inc. The speakers talked about why these BMPs have often not achieved water quality goals for phosphorus and suggested approaches to maximize their pollutant removal effectiveness. To watch the recorded webinar, visit the Webinar page in the Stormwater Manual. The Minnesota Stormwater Manual passed 10 million hits in December, which reflects the wide interest in managing stormwater in Minnesota. We continue to look for ways to expand and improve the information in the manual, so please send us comments and ideas. 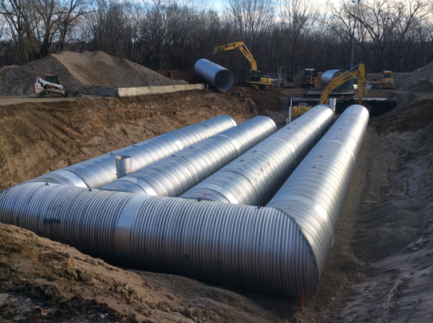 Audit process factsheet and audit process webinar for Phase II MS4s: What to expect when the MPCA audits your stormwater program. Construction site inspection checklist – A checklist for MS4 staff who conduct construction site inspections; includes all the MS4 General Permit requirements. Site plan review guidance – How to review a site plan to ensure it meets all the MS4 General Permit requirements. Facilities inventory template – For documenting municipal facilities with the potential to impact stormwater, as required by the MS4 General Permit. Documentation to retain guidance – Describes the documentation and materials staff for small MS4 programs must retain. Self-audit guidance and self-audit webinar – How to conduct a self-audit on your stormwater program. MS4 webinars and videos – Main page for all MS4-related webinars and videos.